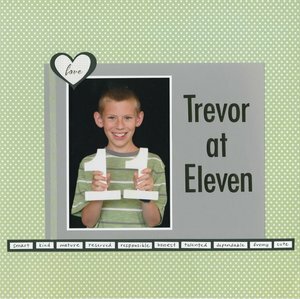 As promised, here is Trevor at 11. As usual, I made my list of adjectives before looking back at previous layouts so that I wouldn't be influenced by how I'd described him before. Of course, the list is pretty similar year by year. Trevor mentioned the other day that we need to have Grandpa make us more numbers. (He originally made 1-9, then made us a 0 and an extra 1 a few years ago.) I love that Trevor thinks we'll still be taking his birthday portraits at 22, 33, 44, etc. I'll count myself lucky if he cooperates through age 18! So awesome! And loving that he wants more numbers!!!!!!!!!!! I have a feeling Trevor will still be doing it... he reminds me a lot of my son who is still very much a happy, mellow, go-w/-the-flow individual. If Trevor was like my daughter I'd say you'd be lucky if he still lets you take his photo after age 13... Then again, I think in general the difference between teenage boys and teenage girls are astronomical! Super cool that his grandpa makes those for him!